368 pps., 50 historical photographs and illus. , index, bib. The following excerpts from Shore Chronicles are abbreviated from chapter-length accounts. ©2000 Down The Shore Publishing Corp.
1764, Pecks Beach: We came to the great ocean and drank of its salt water; it is considered healthful and therefore a great many people, with various illnesses, come here in the spring and summer for two or three weeks to bathe in the water and to drink it. 1828, Long Beach Island: A British barque went aground and a wreck sale was held on the beach. A dense crowd of bidders gathered in the shadow of the high and dry hulk, ready to bid on copper sheathing, casks, cargo, masts and sails. 1829, Great Egg Harbor: To such naturalists as are qualified to observe many different objects at the same time, Great Egg Harbor would probably afford as ample a field as any part of our coast.... Birds of many kinds are abundant, as are testaceous animals. 1850, Cape May: Carriages and horses drive out into the waves, gentlemen ride into them, dogs swim about; more than a thousand white and black people, horses and carriages and dogs - all are there, one among another, and just before them porpoises lift up their heads and sometimes take a huge leap. 1864, Barnegat Bay: I sat on the beach near Barnegat Inlet on a soft balmy day in November from early morning until night and scarcely saw a break in the continuous line of ducks, geese and brant bound south. 1870, Ocean Grove: James A. Bradley, founder of Asbury Park and a member of the Methodist Camp Meeting Association, pitched a tent near a grove of pine, cedar and hickory on his lot in the newly formed community of Ocean Grove. 1879, Atlantic City: I have a fine and bracing drive along the smooth sand (the carriage wheels hardly made a dent in it). The bright sun, the sparkling waves, the foam, the view - Brigantine beach, a sail here and there in the distance - the ragged wreck-timbers of the stranded Rockaway- the vital, vast monotonous sea - all the fascination of simple, uninterrupted space, shore, salt atmosphere, sky, were the items of my drive. 1880, Ocean City: The bay was populous with wild fowl, geese, ducks, brant, loon and others of their kin and it was no uncommon sight to see flocks of blue bills, acres in extent, moving up and down with the tide, and at evening the homecoming of the geese from their day on the ocean, was as regular as the sunset. The woods were filled and thrilled with music, song birds everywhere, from the thrush and robin down to the incisive and persistent mosquito. 1892, Wildwood: That I am at last in a bit of Jerseys primeval forest there is little doubt. Everywhere towering trees bearing evidence of great age, and early in the day I found myself face to face with a huge cedar, dating back at least to the Norsemen. Here was a tree that for centuries the Indians had known as a landmark. 1907, Atlantic City: A young woman may walk the beach in the full light of day in the most abbreviated of costumes and no one thinks any the worse of her... Atlantic City is free and easy, unceremonious and undignified, good-naturedly boisterous and unnecessarily loud, but it is respectable. 1914, Atlantic City: The hotels in Atlantic City are as fantastic in appearance as the place itself. I imagine that the architects have been kept for weeks on the seafront and were probably fed on crab and given gin rickeys to drink. Then, when allowed to drop to sleep in the early morning, they would dream. At the end of a fortnight or so of this treatment their dreams would be imprinted on their memories and they would draw plans of suitable hotels. The Atlantic City hotel is less stately than fantastic. It is a building which any one would declare to be impossible if he did not see it in actual existence. 1917, Little Egg Harbor Inlet: It was mating time, too, and from every dune and marshy place the plaintive cries of the nesting plover came to us, punctuated at times by the sharp bark of a fox of which the dunes held quite a few. And how wild and lonely it all was! During the two weeks we spent there we saw not a living soul. We might have been so many Robinson Crusoes, so far as the outside world was concerned. We were cut off from everything save our own thoughts. 1919, Wildwood: In September the bathing is at its best. The beach itself, colored in the first flush of the level sun, is still faintly warm to the naked foot, after the long shining of the day; but it cools rapidly. The tide is coming in with long seething ridges of foam, each flake and clot of crumbled water tinged with a rose-petal pink by the red sunset. All this glory of color, of movement, of unspeakable exhilaration and serenity is utterly lonely. 1922, Atlantic City: One of the famous amusements of Atlantic City when you are not moving along the Boardwalk in the huge invalid-chairs is to go down to Youngs million dollar pier and see the fish net being drawn. They are very numerous and very varied, it is rather a horrible sight, that mass of pullulating life, flapping and beating in its vain struggle against extinction. 1936, Brigantine: There were no breakers anywhere, no breakers as far as the eye could reach, not a whitecap on the sea. All the ocean was so quiet that when it came up on the beach it just rippled in. There was no small of salt, for the wind was offshore. There was a wall of snow perhaps three feet high at high water mark at the foot of where the dunes once were. The leveling of the dunes has unquestionably brought about many of the inroads of the sea. In many places up and down the coast we saw cottages that had been undermined and toppled into ruins, or thrown about in confusion, or carried in and left stranded quite a distance back from the ocean. 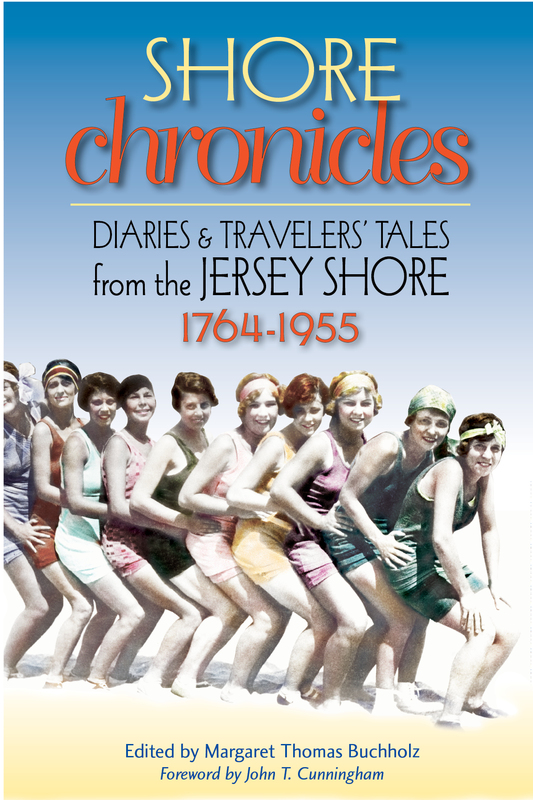 "Dozens of fascinating accounts.... Glimpses of everyday life, as manners and mores evolve over the decades, make Shore Chronicles a real eye-opener." 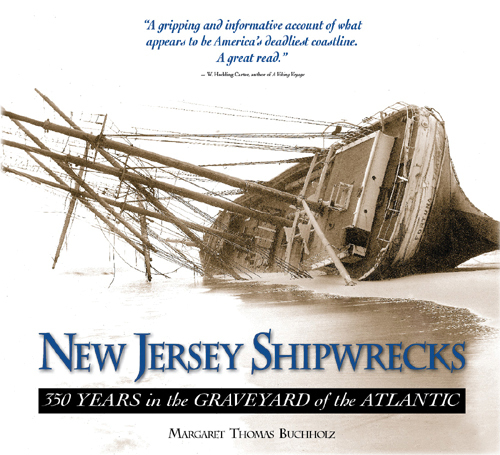 "A captivating history of the shore and the people who made it." remarkable book like Shore Chronicles to make past incarnations of our favorite places real."
. A magic carpet to a simpler time." 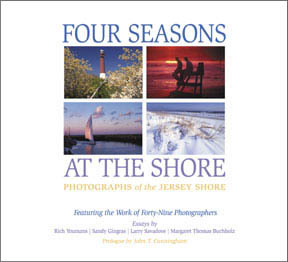 Margaret Thomas Buchholz is the editor of the historical anthology Shore Chronicles: Diaries and Travelers Tales from the Jersey Shore 1764-1955, and Seasons in the Sun, a pictorial history of Harvey Cedars. She is editor of The Beachcomber, a weekly newspaper on Long Beach Island, where she lives.